In recent years, social media has helped foster communication between people all over the world, but email has been doing it for decades. In fact, a 2018 forecasting report by The Radicati Group found the number of email users around the world will reach 3.8 billion by the end of the year. To put things into perspective, this is 100 million more users than 2017. And by 2022, this number is expected to reach over 4.2 billion. So, if you’re a marketer and you’re not using email for business purposes yet, what exactly are you waiting for? Before email, marketers relied on traditional mail for distributing advertisements in the form of flyers, catalogues and promotional letters. Thankfully, today you don’t have to head to your local FedEx and print out hundreds upon thousands of ads resulting in a costly, time-consuming and outdated job. Email marketing has transformed the way businesses reach their customers, turning what used to be a distribution headache into a swift click of a button.But to really appreciate everything it has to offer, we need to dive deep into the history of email marketing and how it transformed into what it is today.Let’s take a trip down digital messaging memory lane. Before email, marketers relied on traditional mail for distributing advertisements in the form of flyers, catalogues and promotional letters. Thankfully, today you don’t have to head to your local FedEx and print out hundreds upon thousands of ads resulting in a costly, time-consuming and outdated job. Email marketing has transformed the way businesses reach their customers, turning what used to be a distribution headache into a swift click of a button. But to really appreciate everything it has to offer, we need to dive deep into the history of email marketing and how it transformed into what it is today. 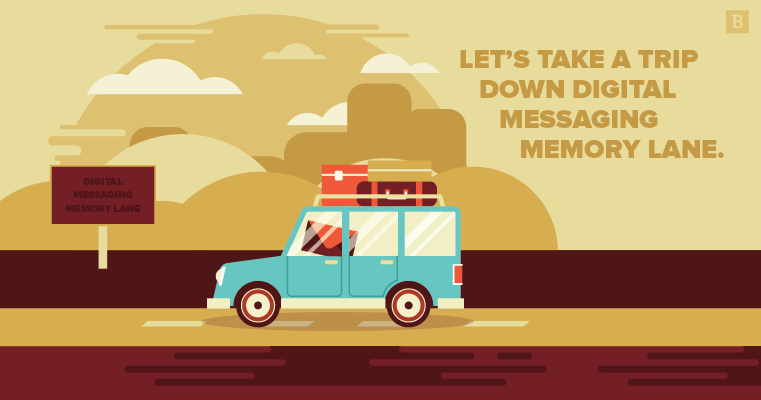 Let’s take a trip down digital messaging memory lane. Can you think back to a time before the internet was a thing? I can’t, because 1991 was my birth year as well, so I sincerely couldn’t imagine a world without it. The introduction of the internet to the general public really changed everything about everyone’s daily lives, but it opened up so many new doors for marketers. Gone were the days of relying on snail mail to send catalogues to promote products and services. With email, marketers could experience a whole new – and simplistic – way to directly reach potential customers. After the success of Lotus Notes, companies began to take notice of its popularity and decided to branch out and create their web-based email database. In 1998, Microsoft developed its Internet Mail, which would go on to be renamed Outlook. The same year, Hotmail launched free email services for the general public. Up until this time, private email was the only form of digital communication. Now, anyone with access to the internet could also create their own personal email address (which consisted of about 20 million American adults). According to Send Pulse, responsive email is the most effective way to improve email click-through rates, as 70 percent of people refuse to open or read and email if it doesn’t transfer well from a computer to their smartphone or tablet. Over the last decade, emails have become so much more than messages filled with general text. Now we pay attention to pre-header text, word placement, visual hierarchy, hero images, gifs and external linking options, all of which can take an email marketing campaign to the next level. In fact, research by Econsultancy found that 73 percent of marketers rate email as the No. 1 digital channel for ROI.